My previous post on William H. Patterson, Jr.'s, Heinlein biography focused on what I learned about the writing business. But that wasn't all I gained from the reading. 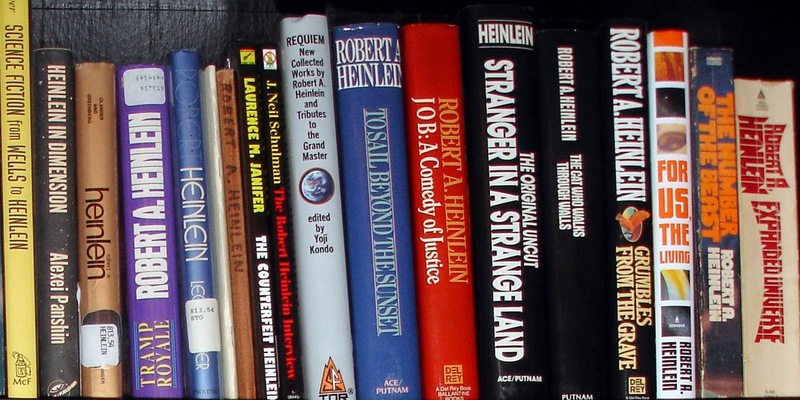 In many ways, Heinlein's life provided general rules to live by as a writer and a person. Take care of your mortality: physical health, mental health, diet and process of aging. Heinlein had numerous health problems. And he was immediate about making change to improve his chances of continuing doing what he loved: writing. So he changed his diet to deal with his many allergies, changed his diet again to deal with his heart health. He studied a variety of mental viewpoints to find a strong way to approach life positively and honestly (self-honesty in particular). He wanted to live a whole lot longer than he did, but considering what he had to battle, he lived a whole lot longer than expected. Maintain and foster friendships inside and outside the field of writing. Heinlein kept his Navy friends, childhood friends, and writer friends as part of his life no matter what changes were going on. He moved every few years for various reasons and made close friendships with neighbors and maintained those from his previous residences. I noticed that Heinlein was also slow to let go of a troubling friendship. He wanted to be certain that he was taking the friendship as it came, not molding it into some prerequisite construct. He seemed to dislike a great deal having to cut off a friendship and was willing to reassess if it appeared the person had changed. Travel: He was interested in other cultures and enjoyed experiencing new viewpoints and lifestyles. I got the impression he did not want to get his information from books. He wanted to see it for himself, talk to people, see the worst and the best in their countries. I haven't been too many places: Mexico, Canada and Sweden, but each offered me different outlooks on life that I came to embrace. I have been all over the US, which has offered quite a bit of difference in diet, interpersonal communication between sexes and personal philosophy. Travel and exposure to variety is a growing experience as a person and a writer. Stand up for yourself. Heinlein had to deal with plagiarism in writing, TV and movie production. There were times he had to fight for his rights (The Puppet Masters) and times he had to clarify a point, less the legal applications (The Rolling Stones vs. Star Trek's "Trouble with Tribbles"). Work to aid humanity. Aside from his political endeavors and his efforts to encourage education in the sciences in his juvenile (YA) books, I think Heinlein was most pleased with the work he did in blood drives, especially as it related to rare bloods. I had not been aware of all his work in this area and was much impressed with his effort to improve participation and increase availability of rare blood. There is a platform for each of us, small or large that can bring positive change. Make friends with your agent, editors, etc. Much of his communications in the biography came from his interactions and friendships with those involved in the publication of his novels, stories and essays. I think often we think of the publishing world as a necessary enemy. Heinlein built lifelong friendships with many of his contacts. Keep family close and value them. Heinlein was not a "I remember you when" kind of writer. His friends prior to writing and his family were important to him. Sometimes it seems that the writer is assumed to separate him or herself from the family as if such contact will ruin the muse. Stay close. It is from family that we grow into who we are and gain our greatest strengths. Be responsible for your self and your family. When Heinlein's mother needed to go into a nursing home, it occurred when he had the money to maintain her care. His sister had been the main caretaker for many years, and he was ready when the responsibility needed to be moved. He volunteered to be the main provider taking the financial burden off his siblings when it was a struggle for them, and he was able to carry it. Recognize your own belief system and be tolerant of others. Heinlein had strong beliefs, , but he seemed to be willing to accept a variety of differences as a natural right. He did draw the line at love of country, patriotism. Use your medium to teach and challenge your readers. Heinlein advocated patriotism, blood drives, right to bear arms, education, sexual equality (but give him some latitude, he was born in 1907), racial equality, and a variety of political viewpoints. As with everyone, as he aged, his beliefs evolved, some growing stronger, others altering based on society, new experiences, research and personal evaluation. He had an agenda, two main ones: make his readers think and entertain them. What author has helped your grow as a person? What about them strengthens your resolve, provides focus or motivation? If you would like to follow or subscribe to my blog, I have provided a variety of ways.